TrancriptionWing, a NY-based transcription company, has launched a new video captioning service in line with its commitment to give the deaf and hard-to-hear equal access to all video materials and electronic communications. “As a socially responsible company, we just felt the need to help the society by providing equal access to informative materials to all, especially the deaf and hard-to-hear. For that reason, we decided to offer this new service,” said Maiden Rea Bernaldez, TranscriptionWing’s Sales & Marketing Advocate. Aside from being socially responsible, Bernaldez said the existing US laws that governs video transcriptions is another reason that made them decide to launch this new service. “The existence of Sections 504 and 508 of the Rehabilitation Act of 1973, which is an anti-discrimination law that requires equal access for disabled people with respect to electronic communications; and the Americans with Disabilities Act, which requires video materials shown in public to be accessible to the disabled, made us think that it’s a great time for TranscriptionWing to venture into this business. This will definitely help us stay relevant in the transcription industry,” said Bernaldez. She added that TranscriptionWing’s new video captioning service is not just meant to cater the disabled but a great way to break language barriers. “There’s a lot of study that supports this,” she said. Just in 2010, the Michigan State University released a study that showed that for second language learners, grasping new vocabulary through videos became more effective with video captioning in the form of subtitles. Hence, video captioning is a great tool to aid comprehension not just for those who are deaf and hard-to-hear, but also to those who speaks a foreign language. 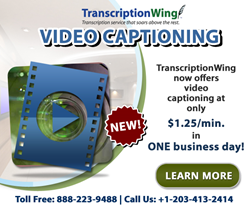 TranscriptionWing is now offering their video captioning price for as low as $1.25/min. 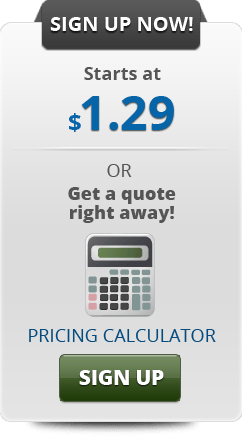 “We want to keep our prices inexpensive. A huge percentage of our clients are educational institutions, that’s why keeping our price student-friendly is key to keeping our clients happy. That’s always been our goal; to offer quality service in inexpensive price that’s delivered in fast turnaround time” Bernaldez said. TranscriptionWing is excited and confident to start their deaf-defying activity through this new video captioning service. For more information, visit TranscriptionWing at https://www.transcriptionwing.com. TrancriptionWing is a Buy-it-Forward company – companies that are committed to giving a significant portion (5+%) of their profits to worthy causes. To check out TranscriptionWing’s Free Trial, click here. To view the details of their customer ratings, click here.